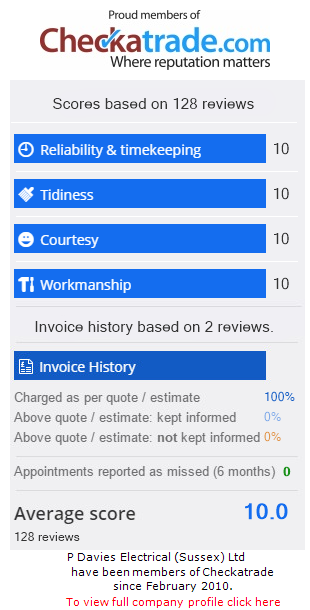 Paul is polite, friendly, he has been very reliable and I would recommend him. We are a small, local, family run Electrical business located just ten minutes North of Brighton & Hove, providing a friendly, trustworthy, timely service offering Electrical installations and value for money. We have over 23 years experience in electrical engineering specialising in Domestic and Commercial Electrical installations and ongoing support, covering all of East & West Sussex. We are insured for £2 million public liability and are fully vetted and checked out by Trading standards (as part of CheckaTrade membership). See our results here.